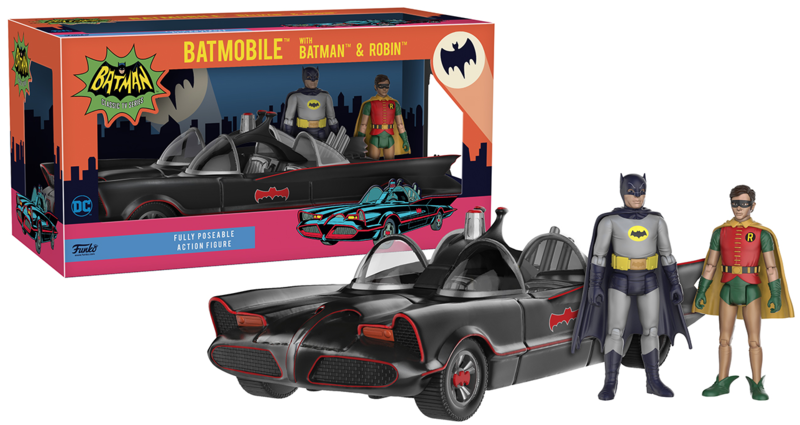 OK, before we even get started with this bit of news, I strongly encourage you to check out the new episode of The Batcave Podcast, featuring an interview with Funko’s senior product designer, Reis O’Brien, about the imminent release of the company’s Batman ’66 3.75-inch action-figure line. Funko might — not will, but might — bring Green Hornet, Kato and Black Beauty into the mix. Now, there are about 13 caveats to this, so don’t go running for your green masks and fedoras just yet. The company has an eye on at least one or two more waves and maybe more, but it all comes down to sales. Reis stressed how important it is to buy from retailers and not individual sellers online — because it’s retail orders that determine a line’s success or failure. But it’s great to know that Green Hornet and Kato are even under discussion. It’s the kind of thing that shows just how much Funko gets it with this line. Seriously, go check out The Batcave Podcast here or here (or on iTunes or Stitcher). We get into the whole line, top to bottom: what’s out soon — and what villains and variants may be on tap. It’s the best Bat-hour you’ll spend this weekend. I would LOVE to see the Green Hornet, Kato, and the Black Beauty! Another property I wish Funko would look into is “The Adventures of Superman.” – There has been ZERO merchandising of this property as far back as I can remember. Warner/DC Comics really ought to allow licensing of this era, assuming whoever owns the rights to the show, and the estates of the actors will agree. Bring on the Batcave playset!